There's some stamps I'll never part with and Stampin' Up! 's Godspeed is one of them. Here I used the Sepia Technique from the October TJNL on my focal image and combined it with SC249 and GC24 Random Redhead Challenge - Stars. The image is stamped in Black on Creamy Caramel card stock, then I applied the Sepia Technique. I layered this panel onto some beautiful Copper Mica from Paper Temptress. 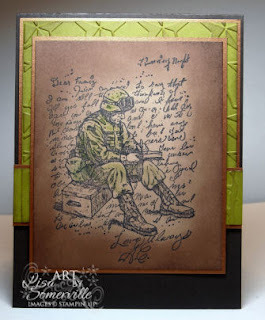 I used the Stars Cuttlebug folder and embossed my Citron Green Brawny panel, I also used the Distressed Stripes folder to emboss my other Citron Green Panel, then applied Soft Suede ink to highlight the embossing. My base card uses Canyon Brown Classic Columns card stock - it's a lighty textured card stock. If you haven't tried the paper from Paper Temptress - you should check it out, the quality is wonderful, not only do your images stamp nicely, but it's great for embossing too! For more information on Paper Temptress papers and their 1 Year Anniversary special click here. I just love what you did with this stamp and tech. Anxious to try some of these papers, WOWZA! Fab card and great use of the stars! I really love how you did the sepia technique. Thanks for playing the Gingersnap Creations Stars Challenge! what a great paper for the technique! gorgeous!